Here’s a fact for you. The shorter your hair is, the less maintenance it requires. That means fewer trips to the stylist or the barber, less time spent in front of the mirror adjusting it every day, fewer products used to make it look in a particular way, and less money spent on all of the above. But does this idea mean that your hair will also look good after you cut back on all of this? Yes. 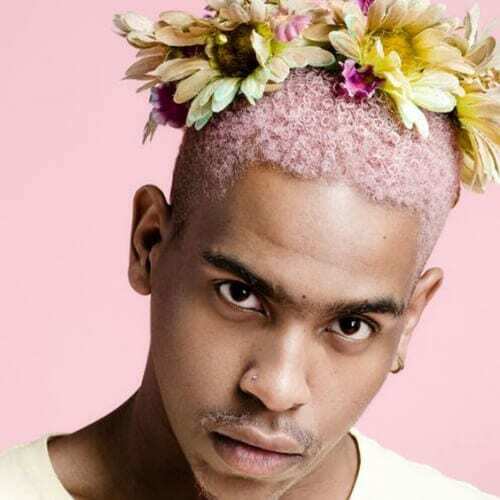 Here are 50 exciting short haircuts for black men to prove it. We begin our list with one of the biggest and most sought-after trends of the last couple of years. 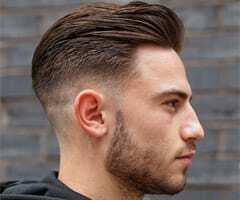 The taper fade has been combined with every other haircut imaginable, that’s how popular it is. Here it is mixed with some locs. The easiest route you can take is to cut your hair short and let your natural curls shine. Just remember to invest in a high-quality conditioner to keeps those curls in place and looking healthy and glossy. Of course, these are not actual tattoos. But because of their resemblance to the skin art, they have been dubbed hair tattoos. This is just an example. You can get practically any model you choose. Michael B. Jordan might have made this hairstyle popular again as of late, but it has been with us for quite a while. 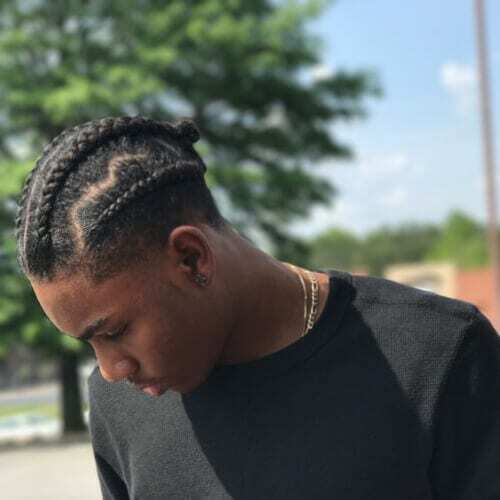 The under shave and gorgeous braids swept to the front are a bold and edgy look meant for a fierce and stylish man. Since unconventional colors are the number one trend right now as far as hairstyling goes, let’s take a look at some shades that you can wear on your short hair. The good news is that you can get them at home without visiting your stylist. This is pastel pink, a gorgeous color that can be your summer look. However, if you’re not up for a commitment, you can just get a temporary coloring while you’re at Coachella or Burning Man and post some pics on Instagram. 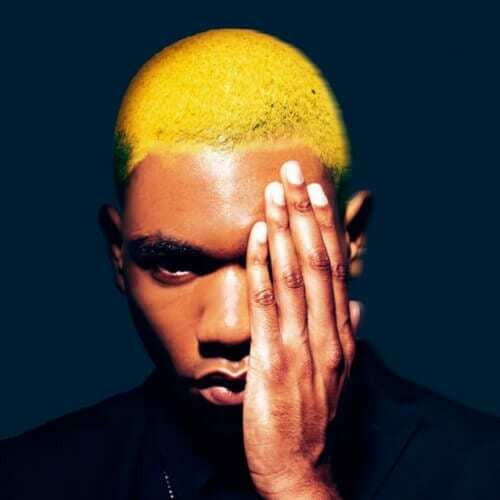 This comic book shade of yellow hair is among the most loved of all nontraditional colors. It’s sunny and bright which means it will highlight your skin beautifully. If you have doubts about choosing a shade, visit your stylist for help. The purple family has a lot of shades to choose from, but we think that this violet is the prettiest. It’s perfect for both spring and summer, transitioning beautifully from one season to the other without any changes on your part. Another super cool trend is the asymmetrical bangs one. It’s especially cute if you have curly hair and decide to grow it out a bit just for styling purposes. This example also includes a deep hard part that goes all the way around. It probably doesn’t get any better or easier than this. You know what they say. If you’ve got it, flaunt it. Natural hairstyles are always the best when you have something to show for them. Therefore, don’t be afraid to be yourself in the process. 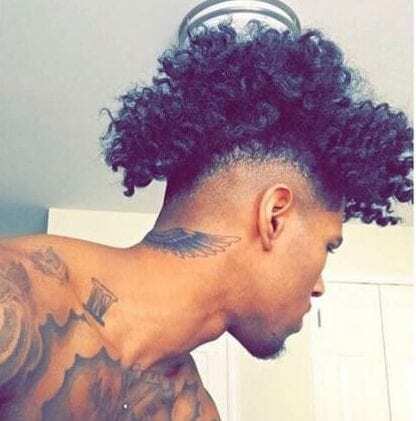 We love it so much when we see an afro that’s been taken to another level. 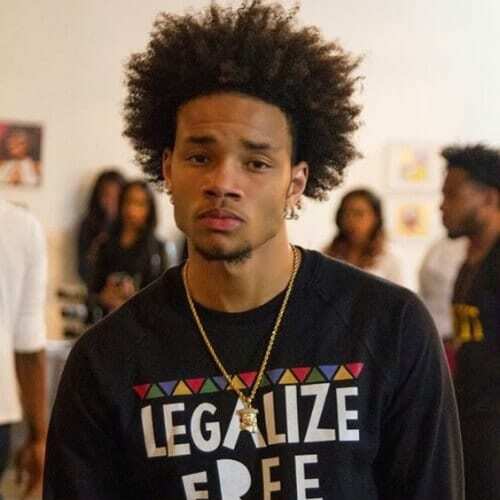 Afros have been with us for such a long time but, somehow, they always end up looking the same. 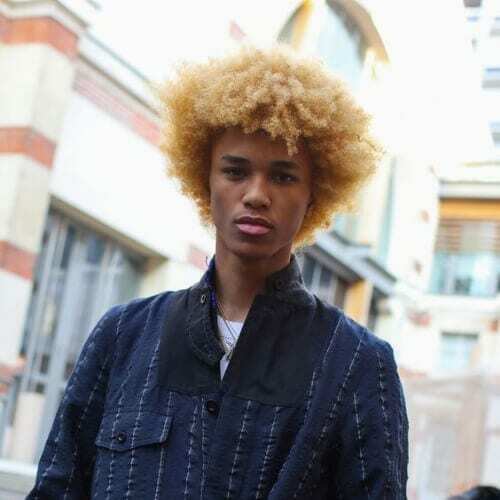 Therefore, when different men put a bit of creativity into their afros, we call it a win. 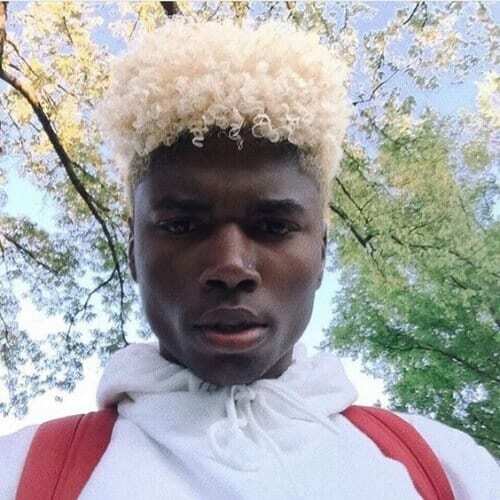 Do you want to go one level higher than blonde? How about platinum? 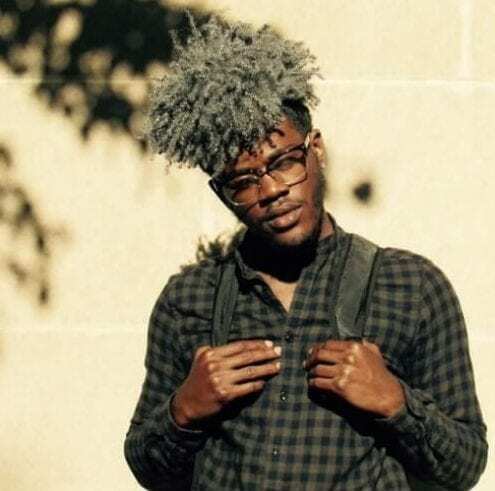 Nothing says style, edge, and courage like a platinum high and tight afro with taper fade sides. This is how you set out to conquer the world. You can even try a shade of gray. Or… more shades of gray? It’s your call. We just love this color and are totally advising you to try it out as a summer alternative to the more traditional brown or brunette hair. The peacock trend is pretty self-explanatory. While there is no standard pattern to it, all you need to do is use only the colors one can see on a peacock to dye your hair. That means cobalt blue, green, turquoise, and teal. 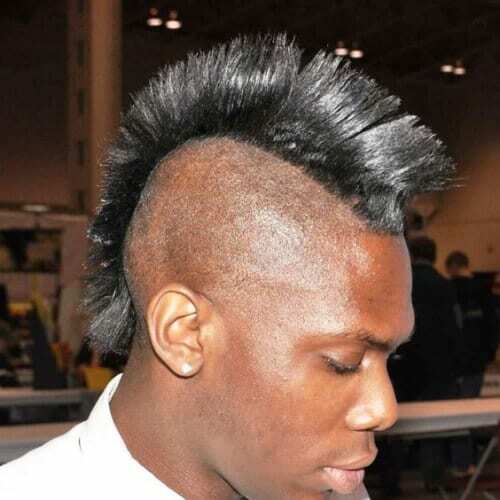 The traditional Mohawk of the 70s with punk spikes is long gone. 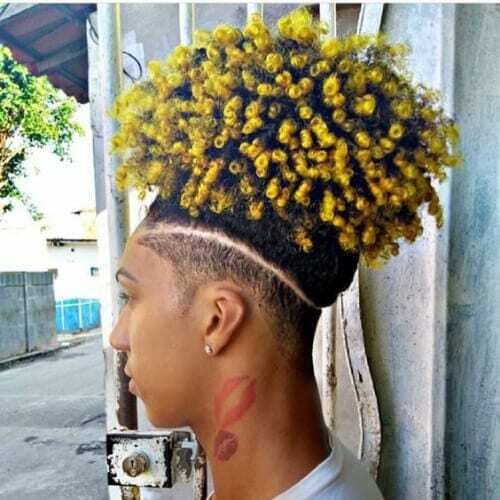 Nowadays guys everywhere are getting more and more inventive on how they can cheat the system and make it seem like they have a mohawk. 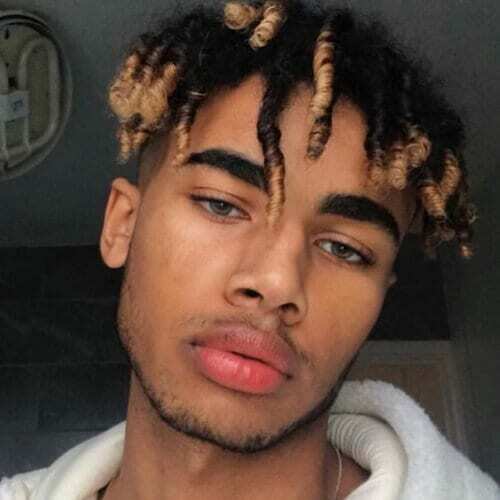 You have heard about the man bun, of course, but did you know about the afro man bun with yellow blonde tips and a deep side part? We bet you didn’t. However, if you did, you are officially our style guru. 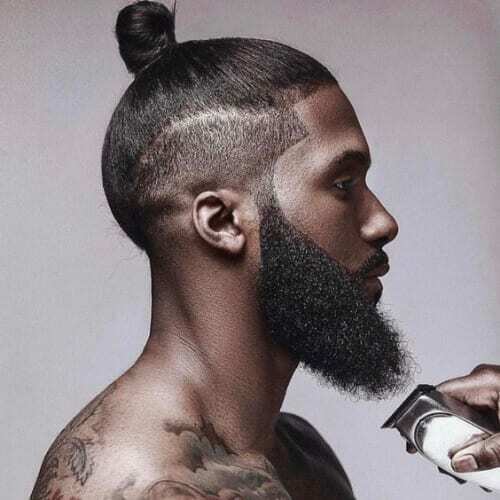 Speaking of which, this is the classic man bun styled here as neatly and sleek as possible with a long beard to match. 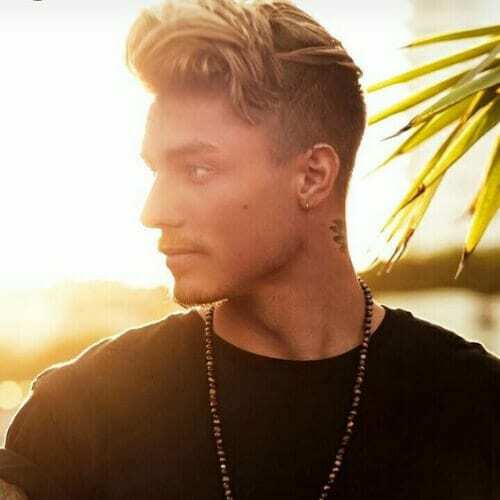 Although one of the most controversial male hairstyles ever, the man bun has been just as adored. 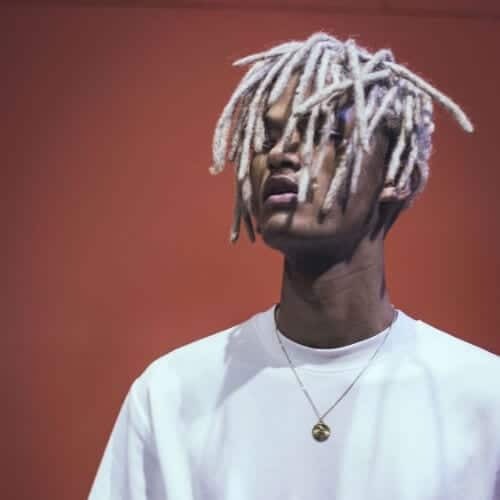 Ever since the trend of the 90s has made a comeback, dyed tips have resurfaced as well. 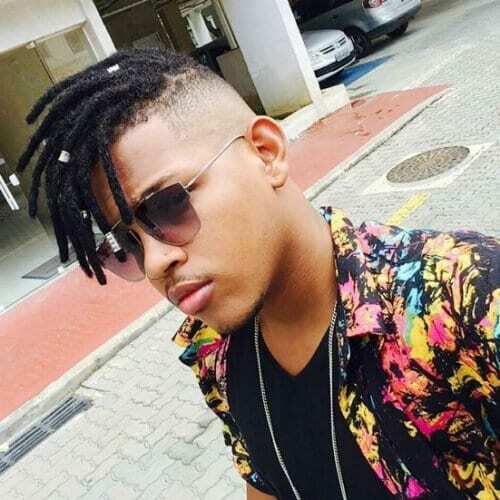 These are golden tips on short twists which you can get if you’re keen on short haircuts for black men. They are quite easy to maintain. 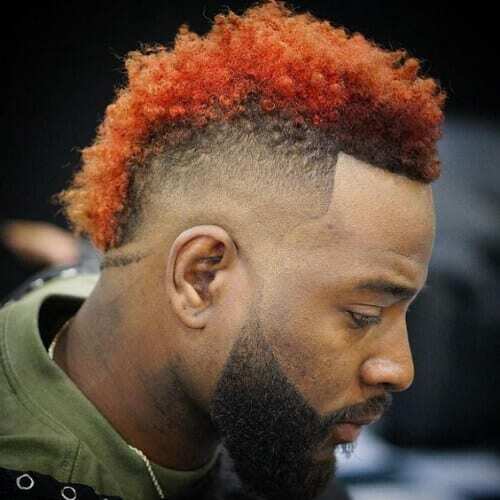 Combining a fauxhawk and a nonconventional color will guarantee your place in today’s top trends. 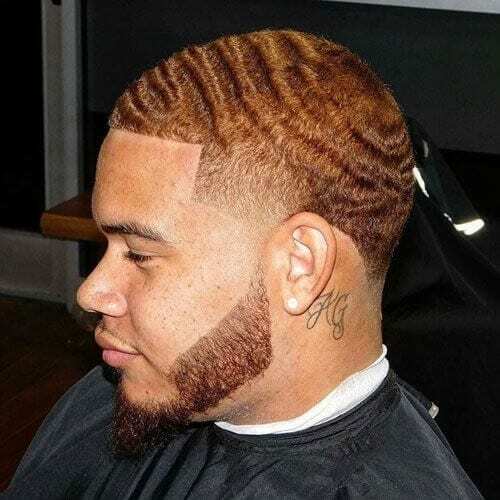 This color is a combination between red and ginger, but the best part is that you can mix and match them as you please. 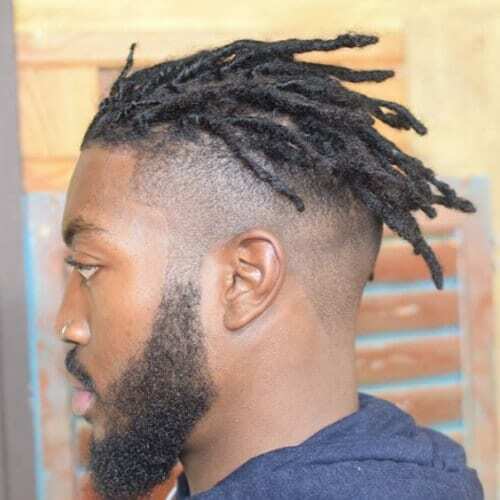 If you are a fan of dreads, you can include them in your short haircuts for black men routine. However, if you want to put a contemporary spin on them, then you must try an eccentric blonde shade, such as platinum. Here’s a throwback picture that will surely bring you feels from the 90s. 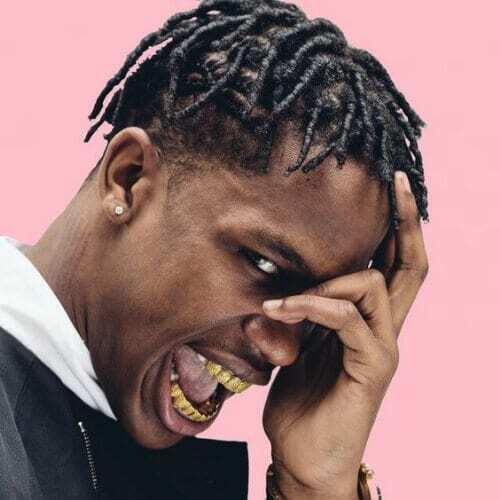 Do you remember when all the 90s rappers used to wear this type of haircut plus those immense baggy jeans which were always light blue and crisp looking? 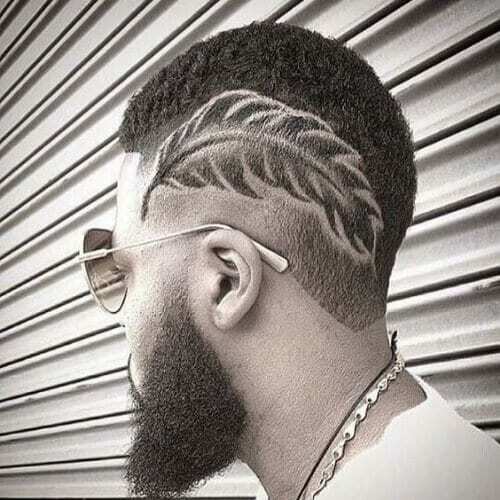 If you have a talented barber or hair stylist, then your imagination is the only limit when it comes to hair designs. Some guys get the logo of their favorite brand while even more get the team they follow on the side of their head. 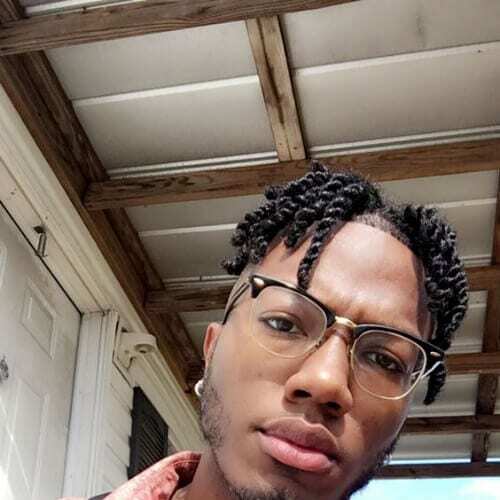 Twists are typically a protective hairstyle meant to keep your natural hair safe and sound. However, they can also be perceived as a styling choice simply because they look so good it’s difficult to resist them. After the man bun and the top knot, the next major style craze were the man braids. 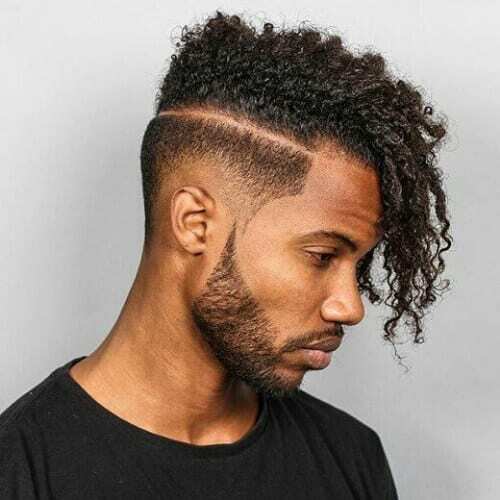 Just as with the man bun, some were against them saying that the style was too feminine while others were completely on board. Here’s another classic one for you. Getting waves in our hair was the only thing we wanted when we were little. 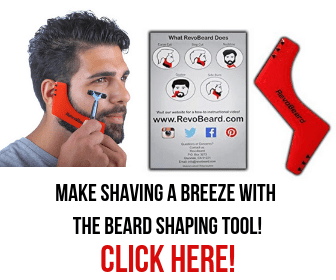 Now you can, and you can also pair this awesome haircut with a fantastic and well-groomed beard. Here’s a trick. If you have thin or thinning hair, a layered haircut will create the perfect optical illusion against that. The layers ad a lot of volume and depth to your mane, which will seem a lot fuller than it actually is in real life. The blowout used to be famous a few decades ago as well. However, since then it has been resurrected. Plus, it received a major upgrade and now you can safely wear it once more in its contemporary version. 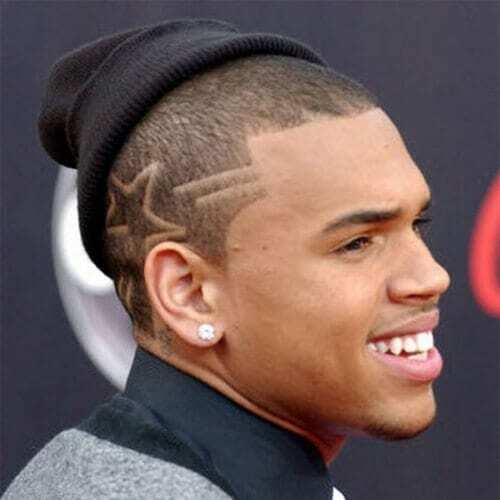 If singer Chris Brown is your style star inspiration, then you will be happy to find out that his hairstyle is very easy to copy. 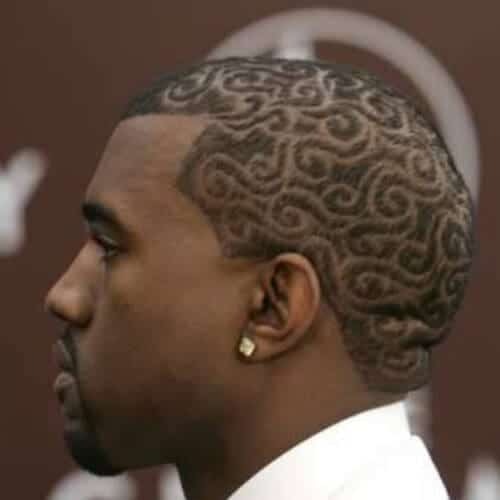 He wears a skin buzz cut with a hair tattoo on one side of the head representing a star and a few parallel lines. Kanye went above and beyond as he usually does and presented to the world a whole new look at this red carpet event. 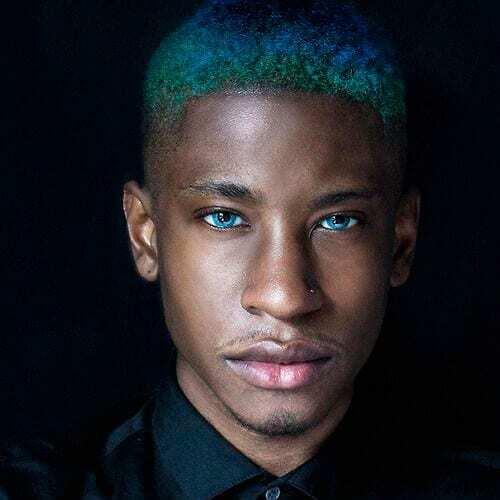 His short haircuts for black men are so meticulously handled that we cannot help but be amazed. If you’re really into hair designs, you can also match your beard with your hair. That means mirroring the design you have in your hair into your facial growth. It’s a bold move but we’re sure the ladies will appreciate it. 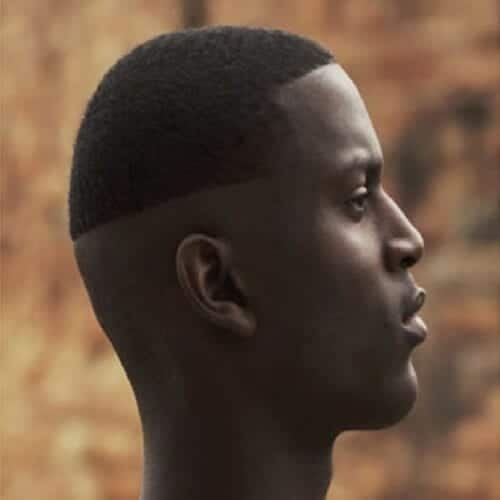 This is one of the most elegant haircuts out there. 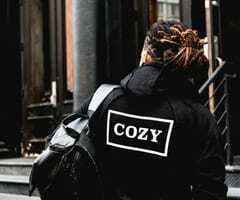 You can pair it with a casual or even full suit and tie look because this will make you the best dressed and styled man in your circle of friends no doubt about it. 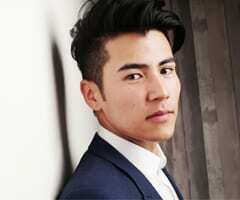 Another very classy hairstyle is the short comb over. You can try it with a deep side part and a handful of hair gel. In this way, you can get ready every morning for the office or for a very important meeting. Teenage haircuts must have an element of coolness about them. However, they must also comply with the rules imposed by most schools about dressing and styling. Therefore, this haircut might be the perfect blend of all that. 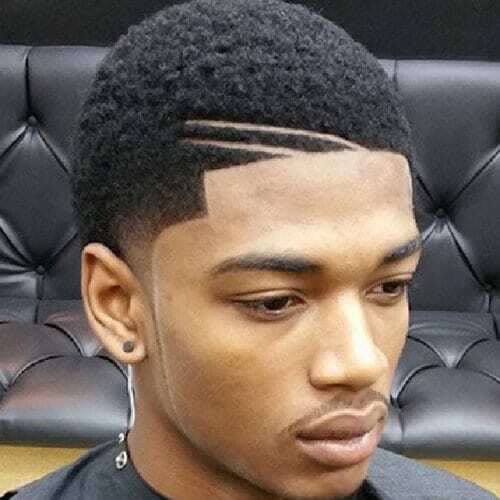 Do you remember the brush cut everyone used to wear in the 80s? It received an upgrade as well and now it looks like this. 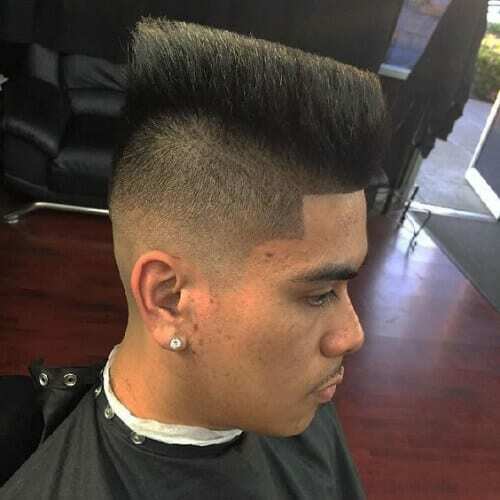 It’s a much higher hairstyle than it used to be, it has a lot more geometry to it, and a taper fade. 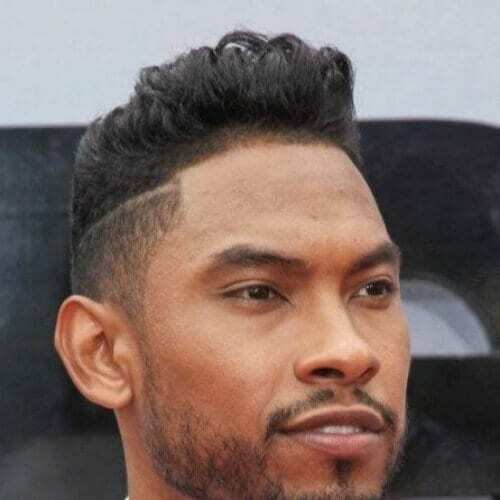 We’ve already seen a fair few fauxhawk ideas on this list of short haircuts for black men. 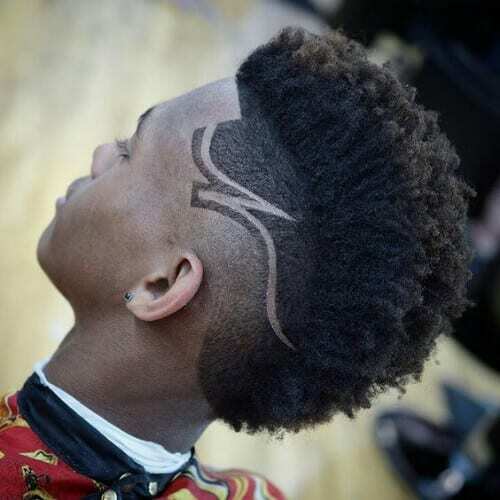 Now it’s time to take a look at the haircut that inspired them all – the traditional mohawk. It used to have shaved sides and a row of long spikes from the forehead to the nape. 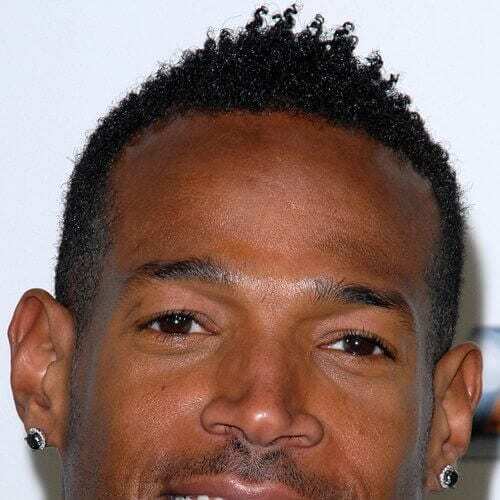 Actor Marlon Wayans’ short haircut is almost as iconic as he is these days. He wears a slim and tight cut with just a few spikes on top. The simple crop serves to highlight his beautifully chiseled features and sparkling smile. 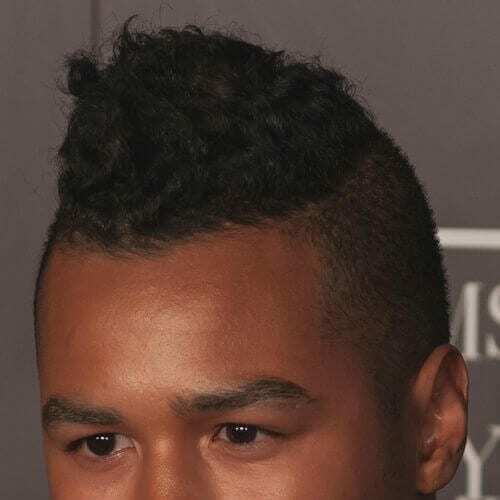 Yes, this is what a luxury and contemporary mohawk looks like. 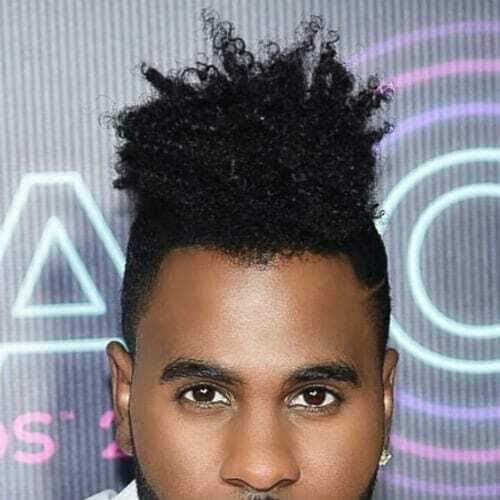 You can tell that men and stylists the world over have been completely enamored and fascinated with the mohawk because they came up with endless versions of it. 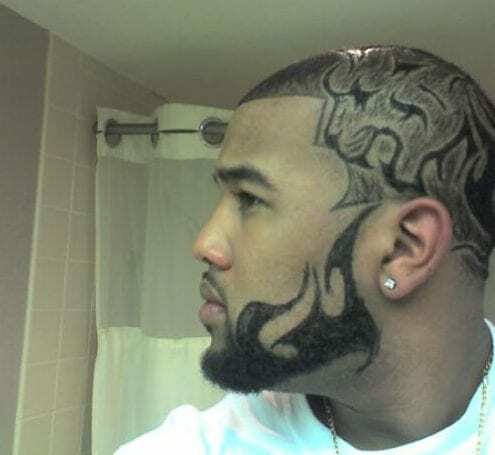 This is a version of the under shave as we know it but with a lot more creativity to it. 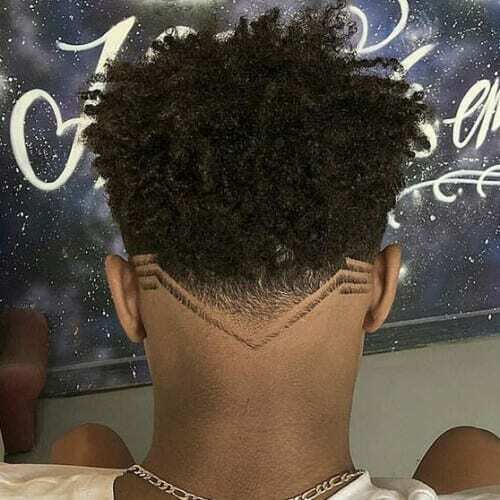 In this alternative take, the entire sides and back have been shaved off perfectly and at the same distance to create this futuristic look. If you have wavy hair you need to make the best out of it. A layered or feathery haircut will be the best option for you, as it will arrange itself naturally and effortlessly. In fact, you will get the coveted ‘I woke up like this’ look. Here’s a way in which you can have your cake and eat it too. 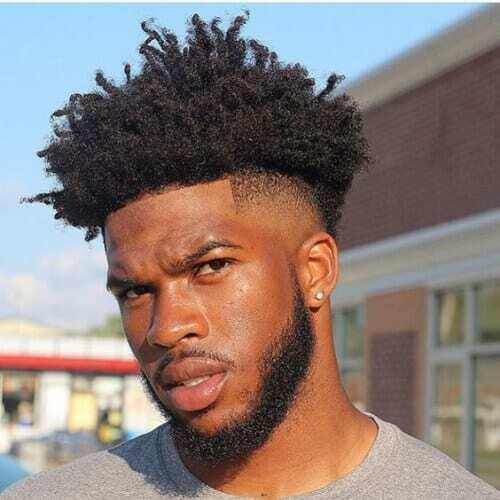 That is to say to sport short haircuts for black men but still keep some of those amazing curls of yours. 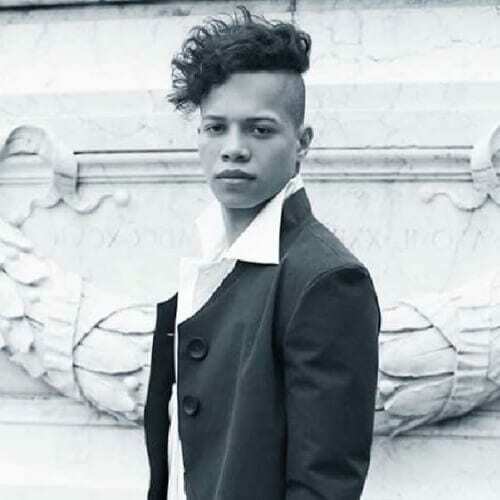 Go for a short crop on the sides and in the back and clump the curls on top. 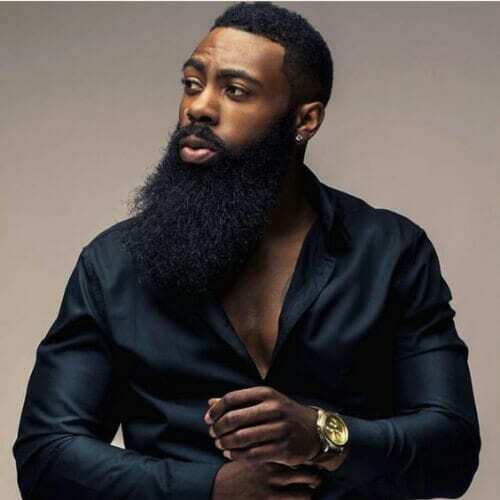 Nothing goes better with a short and crisp haircut than an ultra beard that has been groomed to perfection. Style it with a silk black shirt and a golden watch to underline your elegance, power, and confidence. 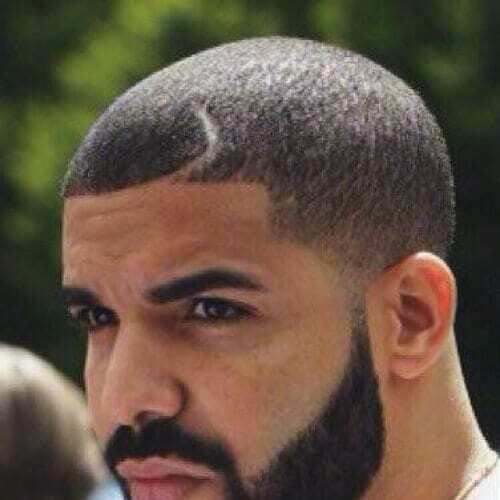 Drake took a swing at hair tattoos as well and ended up with a tiny one in the front. But you know what they say. The best things come in small quantities, right? And a little Drake is still better than none. 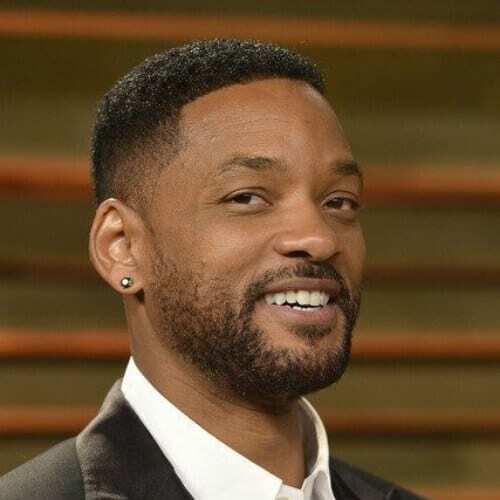 Actor Will Smith is without a doubt one of the most handsome men Hollywood has ever produced. 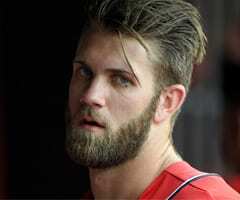 He would look good in absolutely any haircut. 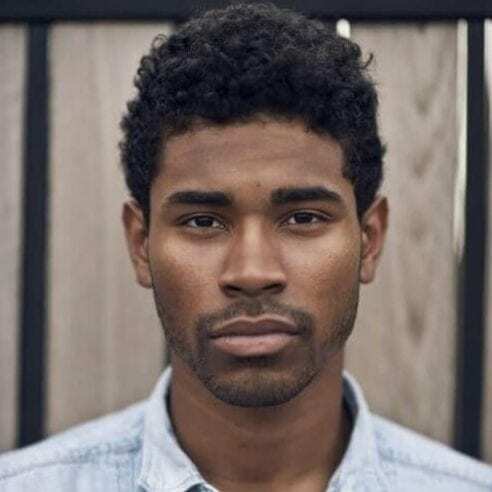 However, we confess we prefer him when he wears short haircuts for black men. 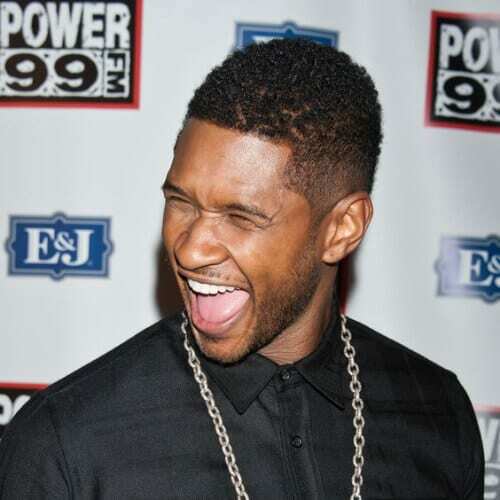 Another incredibly looking artist but this time a singer is none other than Usher. 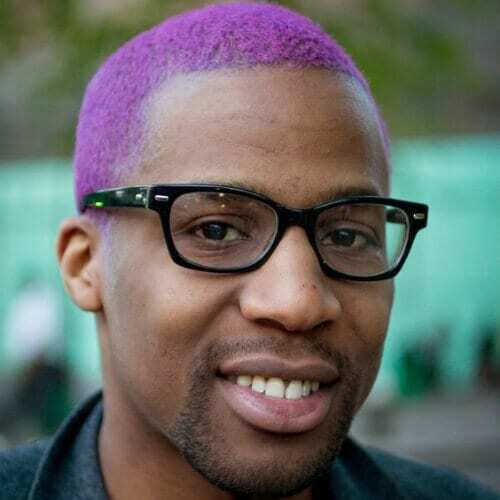 He too prefers short haircuts for black men and has been sporting them his entire career. Remember that when you wear a short crop, it’s all in the styling. 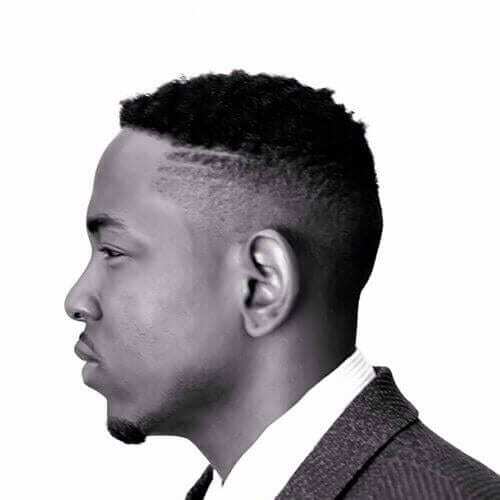 We could not have possibly talked about handsome men in the entertainment industry and leave out Kendrick Lamar. 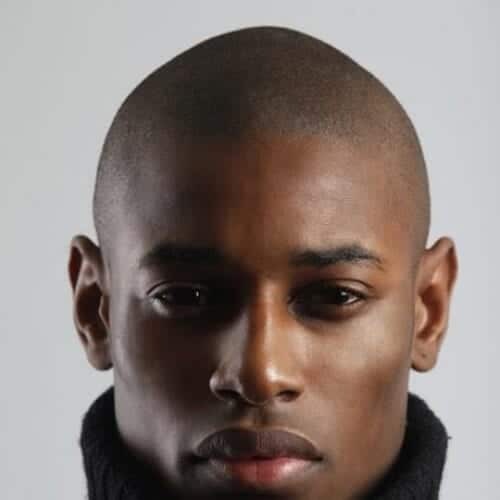 His short haircut consists of a somewhat longer buzz cut complete with a taper fade and parallel design lines. We are completely ready to take fashion and styling tips from the man who managed to marry supermodel Chrissy Teigen. 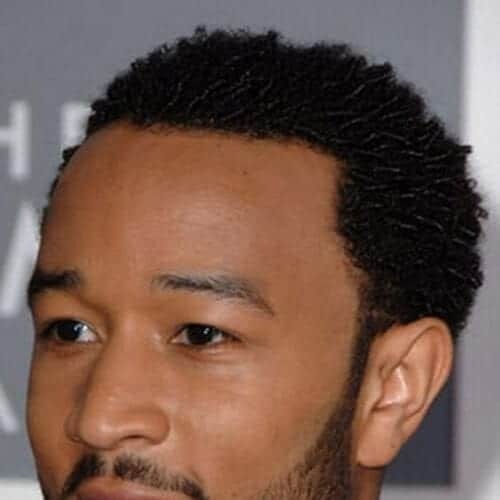 John Legend wins at life at this point, right? Therefore, we will now copy his style. The great thing about wearing short locs as opposed to the medium or longer version is that you can style them in a variety of ways. For example, you can slick them back using some hair wax or a bit of hairspray. This is a two-tone job done to perfection. 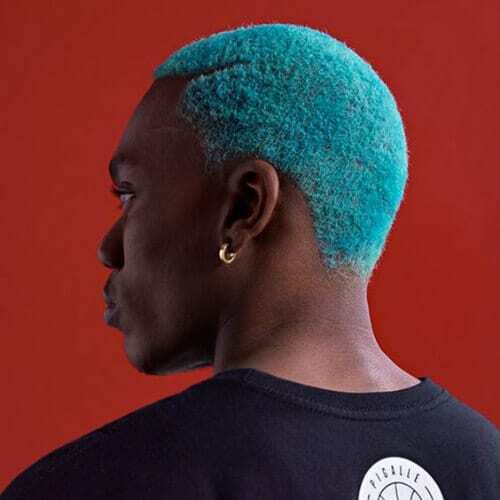 The brunette and the blue are exquisitely separated, and you can see the two layers in the model’s hair as if you were looking at the dye samples themselves. If you’re in love with hair designs, you don’t have to stop at the sides of the head. You can also decorate the nape of your neck. Since you’re wearing short haircuts for black men, that means your neck will be completely exposed and ready for some artwork. 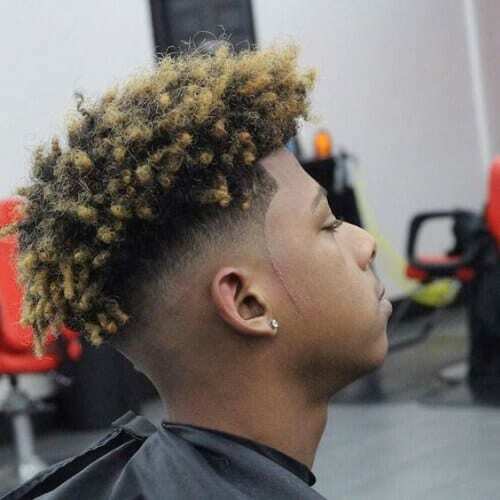 Not to be confused with the buzz cut, the induction cut stems from military life as well where it was the first haircut soldiers got when they entered the army. It was a practical approach that had them shave their heads almost completely. 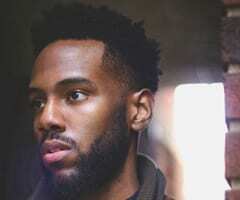 Even though they might seem utilitarian and straightforward in the beginning, a second glance will tell you that short haircuts for black men have come a long way since that school of thought. 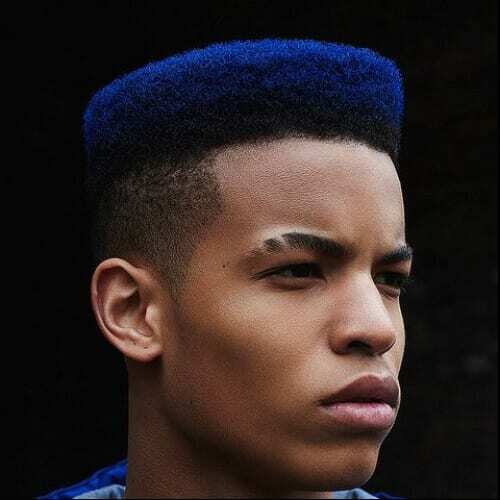 Contemporary style trends have transformed them into little pieces of art that boost nontraditional colors, geometrical shapes and patterns, and hair designs which challenge your creativity and imagination. Tell us in the comment section below which one was your favorite!